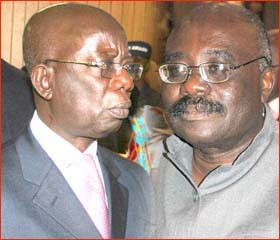 An Accra Fast Track High Court will on August 10, 2010, decide on whether or not to prosecute Dr. Charles Yves Wereko-Brobby aka Tarzan and Kwadwo Okyere Mpiani for causing financial loss to the state in the matters of Ghana@50. The court presided over by Justice Samuel Marful-Sau of the Court of Appeal however made it clear that the court could only deliver the ruling “subject to the approval of the Chief Justice in view of the legal vacation” which commences on August 1,2010. Messrs Akoto Ampaw and Yoni Kulendi, counsel for Dr. Wereko-Brobby and Mr. Mpiani respectively, have already moved separate motions urging the court to strike out the charges preferred against the two. Responding to the separate applications yesterday, Mr. Anthony Gyambiby, a Chief State Attorney who will be prosecuting the case said “the steps taken by the Attorney General to mount this prosecution are within the confines of the 1992 Constitution,” and urged the court to try the case. When Mr. Kulendi took his turn, he said Dr. Wereko-Brobby and Mr. Mpiani could not be the subject matter of the Commission’s enquiry because the terms of reference and the preamble of the Commission were to among other things “enquire into the activities of Ghana@ 50 Secretariat and the celebration”.